How Hydrotropes Enhance Stability and Clarity - J R Hess & Co., Inc. Compatibility issues are common problems in industrial cleaning formulations. Components that are helpful on their own or that improve the overall properties of the solution may also reduce stability or cause turbidity (clouding), separation, and precipitation at use temperatures and pHs, rendering the solutions ineffective. Additionally, some compounds don’t dissolve well in water under any circumstances, so more volatile solvents or emulsifying packages need to be used. There are several strategies for increasing the compatibility and solubility of mixtures that combat some of these common problems. One of the most effective is the addition of hydrotropes, compounds that increase solubility of nonpolar compounds in water and increase the overall stability of mixtures. Some hydrotropes even improve other properties of the mixture, especially cleansing power, making them multi-faceted additions that can be effective in a variety of formulations. Because water is a polar solvent (the oxygens in H2O have a slight negative charge while the hydrogens have a slight positive charge) that includes hydrogen, hydrogen bonding occurs and increases the stability of the liquid phase. Polar compounds, especially those that can also engage in hydrogen bonding, are much more soluble than nonpolar compounds. Hydrotropes act like many surfactants in that they are amphoteric – they have a polar end and a nonpolar end that can arrange themselves around nonpolar solutes and disperse them in a polar solvent. This improves solubility and the stability of the mixture. 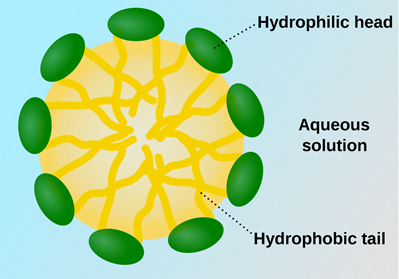 Traditional surfactants, however, generally have longer hydrophobic tails, which can promote micelle formation at high concentrations, increasing the risks of turbidity where particles separate out and become visible in the solution. Many components of industrial cleaners such as builders and electrolytes can lower the cloud point of the mixture, causing it to become turbid around the temperature of use. Hydrotropes such as sodium xylene sulfonate contain an ionic sodium sulfonate group that dissociates in water and a non-polar aromatic ring that is attracted to nonpolar solutes. These compounds can interfere with micelle formation and induce disorder in any developing structures, keeping them suspended in solution. When faced with nonpolar solutes, very small concentrations (0.1 – 15%) of hydrotropes can improve solubility was well as improve other qualities, from foaming to lubrication. Some multifunctional hydrotropes can provide detergent, wetting, and even corrosion resistance through various structural modifications. Hydrotropes are generally recognized as safe and come in varying levels of harshness, making some more suitable for contact with skin than other. They have a low potential for bioaccumulation and can biodegrade aerobically. Some, such as Tomamine Amphoteric 16 by AirProducts, are ultimately biodegradable (>60% in 28 days), as listed by CleanGredients.